The camera was poised to photograph butterflies . . . w/o any in sight. Zip. Zero. But along came this darner . . .
Darners (AKA ‘dragonflies’) are like the sirens that mythically drew sailors onto the rocks. Why? Because I’m out to photograph butterflies and those darners instead appear and challenge me, or the boy in me, to try to capture a half-decent image of them. 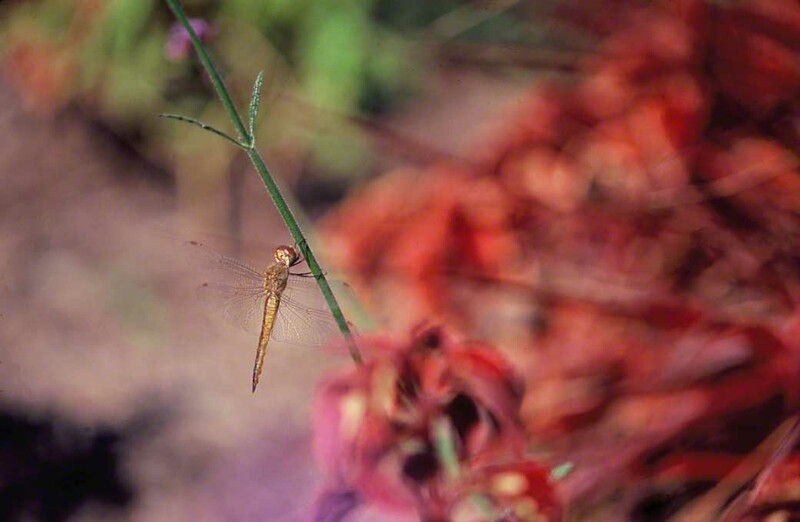 You know that photographing darners is another formidable challenge. And then how often do you capture the amazing intricacy of their wings? Darners remind me again of how reckless we were when we were kids. Once, in a field in Brooklyn, having left my brains at home, and without any hesitation, I saw a large darner (?) flying near me and I (very quick in those days) caught it in my hand, mid-air! Triumph had no time to savor the moment, as an unbelievable torch of pain seared through my hand. My hand released it almost at the moment that I caught it. The excruciating pain lasted for 5 whole minutes. No blood, just an angry red gnash in my palm. Though I continue to enjoy wildlife, I no longer capture critters with my hands. Period. N.B., Would those who know please identify this darner?